Note to my cruising friends: Myself and 23 other authors from the Whidbey Island Military Officers Association put together a new book telling stories of our military life. Great stories from all services. Now available on Kindle and paperback at Amazon and other locations. All the profit for the books sold are put into our scholarship and JROTC funding of high school students. We did it for the Kids! 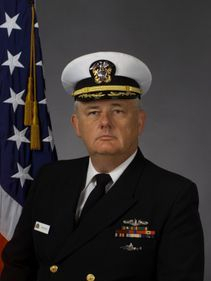 Commander TL Sparks enlisted in the Navy in 1968 after he completed a three year Electronics program at Spokane Community College. His first assignment after boot camp was to the Navy's Electronics Technician "A" school to learn how to operate and repair the Navy's HF, VHF, and UHF communications equipment. As a result Terry learned to operate and repair his first High Frequency (HF) Single Side Band (SSB) Transceiver over forty years ago. After almost nine years of active duty at a Communications Station, aboard two Submarines, and a Satellite tracking and injection facility, Terry left active duty and joined the Naval Reserves. He was commissioned as an Ensign at his fourteen year point and attained full commander prior to his retirement after thirty-three and a half years total service. After active duty Terry enrolled in a night program to attain a Bachelor of Science in Electrical Engineering offered through Washington State University in Richland, WA. Terry attained the BSEE with honors, a long eight years after his enrollment in night school. Terry's civilian employment included: Studio Engineer at WCCO TV in Minneapolis, MN, Chief Engineer for KVEW TV in Pasco, WA, teaching Electronics at Columbia Basin College, and was an Engineering Manager for UNC Nuclear Industries, Westinghouse, Combustion Engineering and ABB Power Systems. 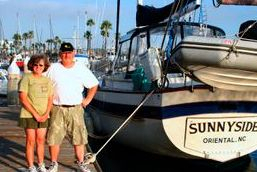 Terry Sailed his first boat over thirty years ago and was hooked at first sail. 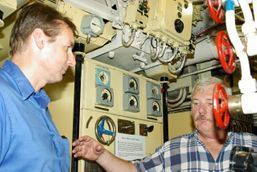 His years in the Navy where he learned Communications, Navigation, Radar, as well as the workings of the many systems involved with making sure that his two submarines both went into the deep and back to the surface clearly honed Terry's skills for the cruising lifestyle. In addition to Terry's Navy time, civilian work and cruising life, he worked and qualified as a N&MC Military Auxiliary Radio System (N&CM Corp MARS) operator in the summer of 2011. N&MC MARS provides emergency communications support via HF and VHF for the United States. The Whidbey Is Naval Air Station's (NAS) MARS operators utilize both the on base communications center as well as remotely via a communications trailer where home made antennas are constructed and hung. In Oct 2015 NAS MARS and Terry changed to Air Force MARS after N&MC MARS was eliminated by the Navy. After a couple of years of cruising, Terry started writing Made Simple for Cruiser books to help others get started living the dream, do it right and come home safely. He will get back to you when ever internet is available. FCC Licenses: General Class Radiotelephone with Radar endorsement; Global Maritime Distress and Safety System Maintainer; Amateur Extra (Ham); Ship Station License and Restricted Operator Permit.